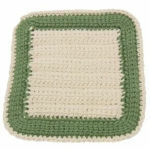 Two Sided Scrubber -- $1.99 A Crochet pattern from Julie A Bolduc. This unique scrubber is reversible! One side is made with nylon yarn for scouring and the other side is made with cotton to hold the soap suds for regular cleaning. Give this one a try! It does work great! I have been using one for over a week and it really works great for every day use.